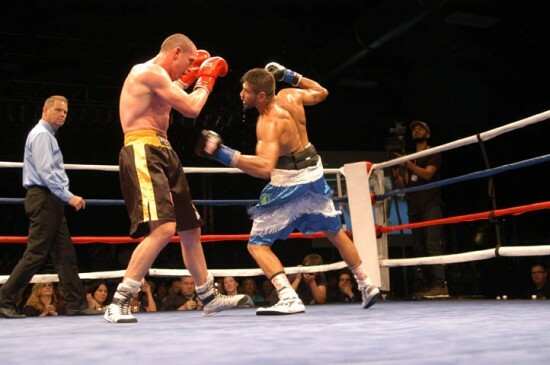 Gavronski, who had not fought since his loss to Dashon Johnson for the WBA-NABA US 168 lbs. title last November, set the tempo early, working his jab from range and following up with occasional right hands. Carr did his best to cut the distance in the early rounds, but Gavronski remained disciplined, boxing well and gradually increasing his output as the fight went on. In the fourth round an increasingly confident Gavronski began to unload with greater consistency, pushing Carr back with straight rights and left hooks, and opening up a cut over Carr’s left eye with a hard right hand. Late in the round Gavronski buckled the knees of Carr and immediately unloaded, trying to finish his opponent, but Carr weathered the storm and made it out of the round. Carr upped his work-rate in the fifth and found some success with a few one-twos, having his best round of the fight. In the sixth Gavronski came out with renewed aggression, though. Mid-way through the round a debilitating right hand followed by a left snapped back the chin of Carr and sent him crashing to the canvass. Gavronski pounced after the count as the referee allowed the action to continue. After three consecutive right hands to the chin of Carr left him wobbly, referee Joel Scobie wisely stepped in and rescued him from any further damage at 1:57 of the round. In the semi-main event of the card, crowd favorite Andres Reyes (5-1-1), of Yakima, Washington, overcame a shaky first round to claim a five round unanimous decision win over the rangy Ramel Snegur (1-1), of Portland, Oregon. Snegur had a good first round, using his longer wingspan to land on the shorter Reyes, catching him with some attention getting uppercuts as he rushed his way into the pocket. Reyes settled down in the second, though, and began to push his way in close with a more measured attack. Reyes took control of the action in the third, working in close, effectively stifling Snegur’s long ranged attack and landing hard hooks to the head and body. The pace continued for the remainder of the bout, with Reyes landing heavy shots in the pocket and Snegur unable to re-establish his distance. The judges scored the fight 48-47, 48-46, and 49-46, giving Reyes his fifth win as a a pro. The bout took place in the Jr. welterweight division. Tacoma’s Andre Keys (2-1, 1 KO) put on an impressive performance, scoring his first win since losing for the first time in his pro career last March to Thomas Turner. In a five round Jr. middleweight match-up, Keys pitched a shutout over Antonio Neal (4-6, 3 KOs) of Sunnyside, Washington. Keys stunned Neal in the first round with a flush right hand to the chin and dropped him twice in the second, first with a left hook to the body, then with a right to the head. Keys used his faster hand-speed and craftier skills to out-land Neal throughout most of the fight. Down the stretch Keys remained in control of the action, using his superior defense and quick lateral movement keep him in position to land blistering three and four punch combinations. All three judges scored the bout 50-43. 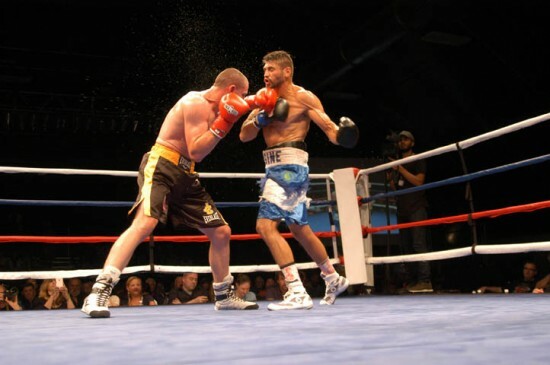 In a close and competitive four round Jr. middleweight bout, Portland Oregon’s Osvaldo Rojas (9-3-2, 3 KOs) broke a two year long lay-off from the sport and claimed his second win over Nate Serrano (4-4-2, 3 KOs), of Yakima, Washington, who was coming back from a three year break. The two had fought twice before, with their first meeting being ruled a draw. Both fighters opened up from the start with the shorter Serrano pressing forward with a busy attack and Rojas trying to block and counter. The first two rounds were close, but Rojas appeared to block a lot of what was thrown his way and land at a more effective rate. In the third round Serrano came out throwing with renewed aggression and sent Rojas reeling onto the ropes with a well placed right to the chin, prompting referee Joel Scobie to rule a knockdown as the ropes held Rojas up. Serrano unloaded after the mandatory count and Rojas obliged his opponents aggression with his own assault, giving the crowd some fierce exchanges. The last round was a close and action packed one, with Serrano pressing his way into the pocket and landing well early and Rojas firing back and having more success late. Two judges scored the bout for Rojas with tallies of 38-37, the last saw it for Serrano at 39-36. After the decision was read, a large contingent of the crowd booed the result, feeling Serrano had done enough to win. Seattle, Washington’s Gabriel Solorio (2-1-1) handed MMA standout Drew Brokenshire (1-1), of Tacoma, his first loss in a professional boxing ring, taking a four round unanimous decision in a welterweight match-up. Brokenshire tried to box early on, moving around the ring and shooting his jab, but the aggressive Solorio did well cutting the distance and landing overhand rights and looping left hooks. In the final leg of the bout Solorio landed the more telling blows, securing the bout with scores of 39-37 all around. An entertaining four round middleweight bout between Tacoma’s Lexus Pagampao (1-1) and Bobby McIntyre (0-3), of Spanaway, Washington, got the card started. Pagampao, originally from Hawaii, cut the distance from the start, stepping in with hard overhand rights and left hooks to the body, controlling most of the first two rounds with the more effective aggression. McIntyre did land a hard right to the chin at the end of the second that appeared to slow Pagampao going into the third, giving McIntyre enough confidence in the round to allow him to work more. Pagampao came back in the fourth, though, and forced the fight, landing in close with wild hooks. The two traded down the stretch, engaging in a vicious exchange to end the fight. All three judges scored the bout for Pagampao with scores of 39-37. The 107th installment of Brian Halquist Productions’ Battle at the Boat played to a packed Tacoma fight crowd. Battle at the Boat 108 will take place November 19th.